Spencer Tracy was one of the finest actors in the history of Hollywood. He did not have the matinee idol looks of a conventional leading man and he did not need them. His talent for acting and the seemingly effortless ease and consistency of his performances were what made him stand out. Tracy made seventy five feature films during a 37 year film career and he was a favorite of both critics and the public. He was ranked at number nine on the AFI's list of Greatest Male Stars of All Time and he was the first actor to win the Best Actor Award in consecutive years (1937 for 'Captains Courageous' and 1938 for 'Boys Town'). In all he was nominated on nine occasions for the Best Actor Award, a record for male stars which he shares with Laurence Olivier. In his personal life Tracy was plagued by the demons of alcoholism and his marriage deteriorated to a sham. He is also famous because of his long relationship with Katharine Hepburn. The couple, both married to other people, met in 1941, and had an affair which lasted until Tracy's death 25 years later. He was born Spencer Bonaventure Tracy on April 5, 1900 in Milwaukee, Wisconsin, into a Catholic working class family. His father, a devout Irish Catholic, was sales manager of a truck company and he had one brother, Carroll, who was older by four years. Tracy was an unruly child and had a poor attendance rate at the many Catholic high schools he was sent to. His father had visions of at least one of his sons becoming a priest, but they both disappointed him although Spencer developed an interest in Catholic theology at his final educational establishment, the Marquette Academy in Illinois, a Jesuit-run high school associated with Marquette University in Milwaukee. Whilst still a schoolboy he developed an interest in movies, often watching his favorites several times and re-enacting parts of them to his friends. He also became interested in the theater and began regularly attending plays with one of his schoolmates, future Hollywood actor, Pat O'Brien. Tracy's studies were interrupted early in 1917 when, along with Pat O'Brien, he joined the US Navy, serving in Norfolk Navy Yard, Virginia, until the end of World War I. On discharge he returned to Marquette Academy and then continued his studies for a year from 1919 at the Northwestern Military and Naval Academy near Lake Geneva, Wisconsin. In 1921, whilst studying at Ripon College, Wisconsin, he first got his taste for the stage as a successful member of the debating team after which he played the lead in a play entitled 'The Truth' which earned him his first critical review as "an unusually strong actor". Having decided on acting as a career, he successfully auditioned for a place at the American Academy of Dramatic Arts in New York. Pat O'Brien had also been accepted and the two lived together for a year from 1922. His first Broadway role was as a robot in Karel Capek's science fiction play 'R.U.R. ', followed by five other Broadway plays in the early 1920s. He then he joined a stock company in White Plains, New York working as a janitor and as a salesman to make ends meet. He met his future wife, Louise Treadwell, when they were acting and touring in stock together and they married in September, 1923. Tracy continued to learn his trade in stock for several years around Michigan and in Canada until 1930 when he appeared on Broadway in 'The Last Mile' which was a popular hit. The play was seen by movie director John Ford who signed Tracy to appear with Humphrey Bogart in 'Up the River' in the same year for Fox Film Corporation. After signing a contract with Fox, Tracy moved with his family to Hollywood in 1931 and began to work hard in his new profession, making over 20 films in the next four years including 'Goldie' in 1931 with Jean Harlow and '20,000 Years in Sing Sing' in 1933, and playing opposite established leading ladies such as Loretta Young, Claire Trevor and Bette Davis. He established a reputation for a skilful, relaxed acting style and his popularity with the public steadily increased, but few of his films were successful financially and he began to feel frustrated that his burgeoning talent was not being showcased in more meaningful roles or better quality movies. In 1935 Tracy made an important career change when MGM bought his contract from 20th Century-Fox. Louis B Mayer, head of MGM felt that Tracy's relaxed acting style would be an ideal counterpoint to their rugged number one leading man, Clark Gable. He was to spend over twenty years with that studio expanding and perfecting his great natural acting gifts. After some minor parts he played the leading man in 'Fury', directed by Fritz Lang and then in 1936 he received his first Academy Award nomination for Best Actor for his performance in 'San Francisco', co-starring Clark Gable. This was swiftly followed by 'Libeled Lady', a screwball comedy, with William Powell, Myrna Loy, and Jean Harlow. In both of the following 2 years he won the Academy Award for Best Actor: in 1936 for 'Captains Courageous' and in 1937 for 'Boys Town'. It was the first time the Best Actor Award had been won in consecutive years and Tracey became a Hollywood superstar. His box-office successes continued in 1939 with 'Stanley and Livingstone' and in 1940 with 'Northwest Passage' and 'Edison the Man'. The following year brought another hit movie with 'Dr. Jekyll and Mr. Hyde' and Tracy found himself topping even Clark Gable as MGM's leading actor. Then in 1942 his life changed for ever. He met and fell in love with another mercurial talent, Katharine Hepburn. Tracy had been married to actress Louise Treadwell for 19 years when he first worked with Katharine Hepburn on 'Woman of the Year' in 1942. He and Louise had two children, John, born in 1924 and Susan, born in 1932. John had been born deaf and Louise had, as a result of teaching him, become an activist for deaf education and eventually, with the help of Spencer, founded the John Tracy Clinic at USC. Tracy was a drinker and a womaniser. During the 1930's he had a relationship with Loretta Young and later, during a break with Hepburn, he would romance his co-star, Gene Tierney, but he was adamant that due to his Catholic faith, he would not divorce Louise. He and Katharine Hepburn were an established Hollywood couple for the last 25 years of Tracy's life but their relationship was not public knowledge and they were able to carry on their affair in absolute secrecy, even maintaining two dwellings to give the impression of living apart. It was an era when Hollywood careers could be destroyed by scandal and they dared not risk their secret becoming known. They went on to make a total of nine films together including 'Without Love' in 1945, 'Adam's Rib', one of the top films of 1949, 'Pat and Mike' in 1952 and 'Guess Who's Coming to Dinner' in 1967. In some ways they were an unlikely couple: his working class masculinity and her upper crust sophistication but they complemented each other perfectly and their on screen charisma worked. Tracy continued to be a top ranking star through the 1950's and 1960's, giving top quality performances in major movies such as 'Father of the Bride' in 1950 with Elizabeth Taylor and 'Bad Day At Black Rock' in 1955, with Lee Marvin. After' Bad Day at Black Rock', for which he received another Best Actor Award nomination, Tracy came to the end of his contract with MGM, and he henceforth made his movies as a freelancer for different studios. Some of his finest performances were yet to come. In 1958 he was nominated for The Best Actor Award for his performance in 'The Old Man and the Sea' and again he was nominated for the Award in 1961 for his performance as defense attorney Henry Drummond in 'Inherit the Wind' and in 1962 as Judge Dan Hayward in 'Judgment at Nuremburg'. These last two were his seventh and eighth nominations. After his appearance in 'It's a Mad, Mad, Mad, Mad World ' in 1962, Tracy was hospitalized with a congested lung condition and forced for the next four years to turn down many film roles. He had been something of a hellraiser all his life and in the mid 1960's he was diagnosed with diabetes. His alcoholism also began to catch up with him and for the last 5 years of his life he was looked after at his Beverly Hills home by Katharine Hepburn. He looked frail and much older than his sixty-seven years when he made one final film with her in 1967, 'Guess Who's Coming to Dinner'. Tracy received his ninth and final Academy Award for Best Actor for his performance. It was awarded posthumously. 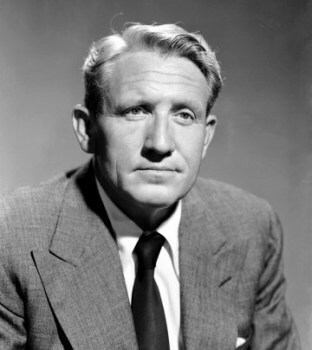 Two weeks after completing the movie, on June 10, 1967, Spencer Tracy died at home of a heart attack. He was 67. Katharine Hepburn, who was in the house when he died, did not attend his funeral out of respect to his wife and children.